Living in hot Phoenix, AZ, one might not think that Arizona roofs need much maintenance or are subjected to many repairs. But the heat can be too aggressive for roofing materials such as shingles or even tile. The hot Arizona sun often compromises the integrity and health of your Phoenix roofing structure and chances are, you will not realize it, until it is too late. While some residents might be able to perform minor roof repairs on their own, there are plenty of good reasons, when a Phoenix roofing expert should be consulted. While some residents might be able to perform minor roof repairs on their own, there are plenty of good reasons, when a Phoenix roofing expert should be consulted! In Phoenix, leaky roofs typically appear during the monsoon season. The ongoing, strong rains uncover any roofing issues there might be. But roofing leaks, can turn costly. Aside from costly water damage to flooring, furniture and paintings, it can lead to electrical issues, and more. Clean up and repairing issues arising from water damage is time intensive and expensive. Even worse than damage to your home is the potential health hazard for you and your family. Water damage causes dampness which in turn is an environment conducive to mold growth. Mold, is extremely unhealthy when inhaled, especially for those with compromised immune systems or people with breathing issues such as Asthma or allergies. Call your Phoenix roofing contractor to ensure proper roof leak repairs and that no moisture is trapped anywhere. Roof Planking, also known as the protective layer underneath your roof tiles can begin to warp over time. Arizona’s extreme temperatures can compromise the integrity of your roof planking and as a result shingles, tiles, as well as other roof coverings can fall of you Phoenix roof. This is not only inconvenient, but more over extremely dangerous for anybody passing below the roof. Just imagine, a roof tile would hit your children, your spouse or family dog. Repairs of this magnitude are also better left to your roofing expert. Even though foam and rolled roofing generally only require little maintenance and are not very susceptible to damage, once in a while you need an expert to help you out. For example, the sealant could break, compromise the roofing layer, allow water and other harmful elements to pass and cause damage to your home or structure. Reasons for a breakdown of the sealant are varied. Anything from the Phoenix monsoon rains to hail storms can impair the efficiency of the sealant. The same thing can happen, if the sealant has reached the end of its lifespan. Call a professional to re-seal your foam or rolled roof, to ensure a job done right. If your roof is older than ten years, it might be due for a replacement. The extreme heat in Arizona breaks down shingle and tiles over time, cause them to deteriorate, crack or break. Have your roof inspected annually to prevent roof and home damage, to check for leaks and other issues, to inspect the planking, the underlayment and to fix any issues before they become too costly. 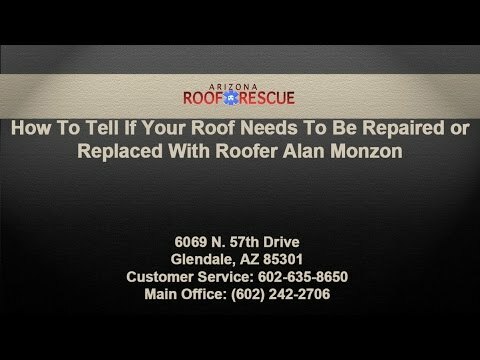 Arizona Roof Rescue has been in the business for years, and is your trusted source when it comes to PHX roof repair and maintenance. Our expert roofers can evaluate the state of your Phoenix roof and suggest a course of action. If you think your roof needs some TLC or even needs replacement, give us a call today at 602-635-8650 or visit our website to learn more about the roofing services we provide.